Sales of "Alegria Reserve by Birdstone Winery" wines benefit Alegria Guild of Children's Hospital Central California. Guild members join the Kirk Family of Birdstone Winery in educating the public about Children's Hospital, community service and local wines. "Alegria Guild Reserve by Birdstone Winery" wines to be offered this weekend during the Madera Wine Trail's Wine & Chocolate Event. Alegria Guild members pour "Alegria Reserve by Birdstone Winery"
Birdstone Winery and Alegria Guild of Children's Hospital Central California will pour the wines they have collaborated on for the sake of Central California's children this Saturday and Sunday. Birdstone Winery donates proceeds from sales of "Alegria Guild Reserve by Birdstone Winery" to Alegria Guild of Children's Hospital Central California. Guild members choose varietals and blends along with Birdstone's winemaker/owner Tony Kirk, pour the wines at local events and even participate in grape harvest. 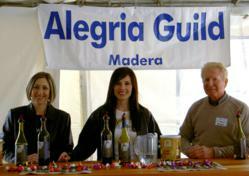 Members of Alegria Guild will pour their Chardonnay and Dolcetto wines at Birdstone Winery this weekend during the Madera Wine Trail's Wine & Chocolate event, February 12 and 13, 2011 from 10 to 5pm. The wines are available year round in the winery's Tasting Room, in local retailers and restaurants, and on the Birdstone Winery website. "This is a huge opportunity for us to give back to Children's Hospital and the community as a whole," said Kirk. "We feel like the members of Alegria Guild have become part of our family." When guild members approached Kirk in 2005 about the idea of creating a private label wine with his small family-run winery, they didn't know the family's oldest son had been born prematurely and was treated at the hospital. "We had no idea how we would sell it, what we were doing, or how we would pay him," said K.C. Pomering of Alegria Guild. "Tony said he'd say yes now, and we'd work out the details later. It's been five years and thousands of dollars in donations - and he and his wife Kimberly just keep on giving. They're some of the most generous people I've ever met." New wines are released under the guild's label each May. Alegria Guild, along with the other Guilds of Children's Hospital Central California, are in the process of raising $5 million for the The Guilds Child Abuse Prevention & Treatment Endowment, which will aid abused or neglected children through programs at the hospital. Birdstone Winery is a family-owned winery on the eastern edge of California's Madera County. The Kirk family strives to make world-class wines from Madera-appellation grapes. http://www.birdstonewinery.com.